This entry was posted on August 11, 2009 at 11:54 pm and is filed under style. You can follow any responses to this entry through the RSS 2.0 feed. You can leave a response, or trackback from your own site. i disagree with this one totally. there are definitely more than two types of skiers but i’ll say that people who wear jeans are “safe” skiers who cruise. there’s no shame in falling, especially if you’re pushing the envelope to improve. chances are if you are jumping off a bigger cliff into deeper powder than you ever have before, you’re gonna wish you hadn’t worn those jeans. 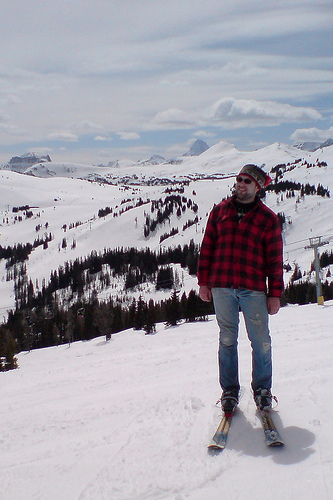 also, i think skiing in jeans makes you look like a hillbilly.